Total Score: 6.67 + INNOVATION AWARD! 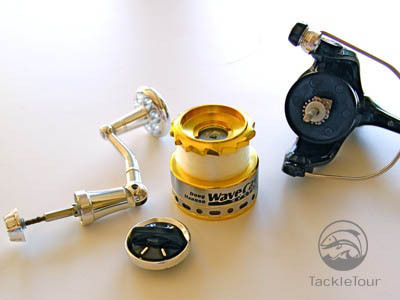 Introduction: Our formal introduction to this product was at ICAST 2007 where Russ Riley, VP of Operations for WaveSpin (formerly WaveCast) enthusiastically showed us their new spinning reel. Naturally, the first thought that popped into our collective mindset was "gimmick". 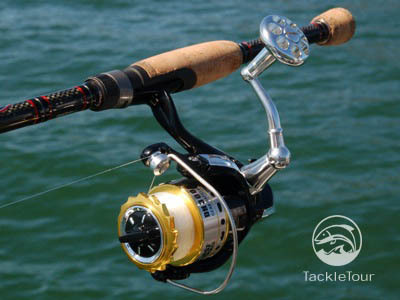 Afterall, during an event where industry giant Shimano debuted their new spinning reel design featuring a smooth, even tapered lip to ease the flow of line off the reel's spool, how could a reel that is, in ever sense of its design, the antithesis of Shimano's new concept function? Well, Russ made sure we did not leave the show without first sneaking one of his reels into our photobag. Was that a wise move? Let's find out. 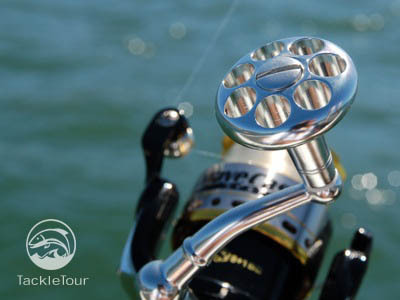 Impressions: It's all about the spool with the WaveSpin spinning reel. Designed by ESPN's Bass Professor, Doug Hannon, the theory behind this radical lip is to effect longer, smoother casts by minimizing friction points between your fishing line and the reel's spool. 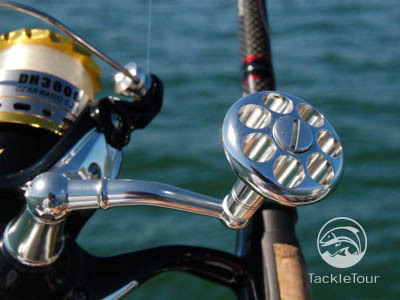 Similar to how a bass boat on plane skirts on the surface of waves and hops from crest to crest, the WaveSpin spinning reels spool's lip is designed such that the fishing line is only in contact with the reel at each crest of the spool's jagged edge. Between these crests, the line floats free, unencumbered by distance robbing friction. Interesting theory, no doubt, but then, why has it taken so long for someone to actually implement something like this? That's what we're here to investigate. The Field Tests: Still unsure what to make of this reel, I spooled it up with 100 yards of 12lb Berkley Trilene monofilament. It could have easily taken more line, but I wanted to put the reel's lip to the test, so intentionally underfilled the spool. Then I packed it up to take with us to Clear Lake on our trip to fish with Gary Dobyns and his new rods. Casting: Once on the water and in our first spot, and a lot of "what the heck is that" comments from both Dobyns and Zander, I asked Dobyns if he had a spinning rod I could try out with this new spinning reel. He handed me one of his Champion Extreme EX703SXF rods and I quickly mounted the WaveSpin reel, spooled it up, and tied on one of my WaddaJigs. 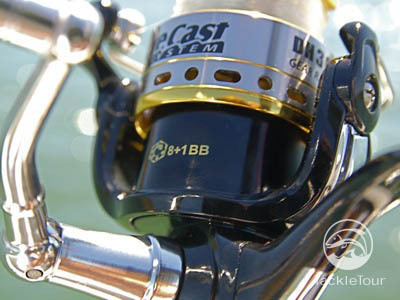 The fateful moment had arrived, the first cast with this funky new reel. I reared back, let her rip and kersplunk! My cast went all of thirty feet. Bleah! What was this all about? The reel can't cast worth a darn! Both Zander and Dobyns were laughing at me. I was disappointed to say the least, but not the least bit surprised. That experience only seemed to validate initial suspicions that this reel was a gimmick. But I did not give up there. In order to give the reel its proper due, I quickly reeled up my spoiled cast and tried again. I reared back. let her rip and hey! This time, the line flew off the reel just fine! Let's try that again! Throughout the remainder of the day, the WaveSpin reel performed perfectly fine. In fact, considering the amount of line I had on the reel, it performed more than fine, it was actually borderline impressive. 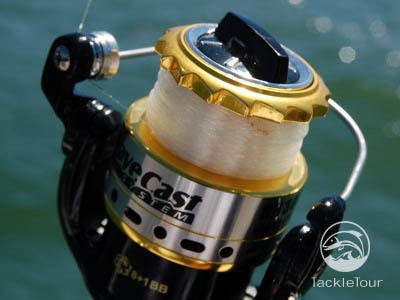 I wouldn't go so far as to say the WaveSpin effects longer than average casts as I believe is advertised, but I will say if not further, then certainly within the expected average for a spinning reel which is a far cry from the very first cast I tried to make with the reel. Retrieve: The WaveSpin spinning reel proudly sports 8 bearings throughout its construction and together with its inshore styled knob that I believe is bearing supported (I couldn't get the knob off to verify), feels very smooth. 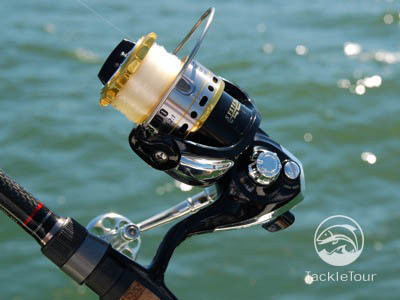 There is a small amount of resistance as you turn the handle, almost as if the gears are surrounded by too much grease, and you can feel the tiniest bit of vibration when you turn the handle, but if it weren't for the fact I'm accustomed to my Daiwa Exist spinning reels, I may not have noticed. 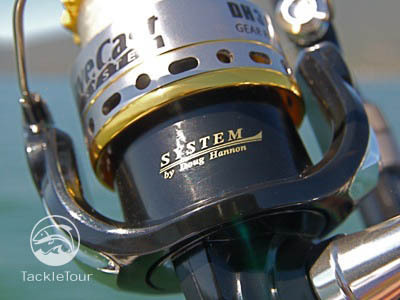 For the reel's price point, the Wavecast is more than respectable in this department. 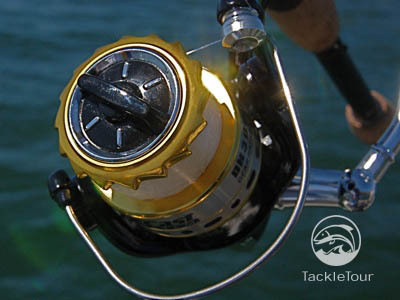 The instant anti-reverse engages without hesitation on this reel and for those who prefer to back reel, the on/off switch for this feature is located at the base of the reel and enacted with a very positive click back and forth. On the actual start of retrieve, the bail clicks over very easily and very solidly with a muted "click" thanks to an internal trip mechanism. 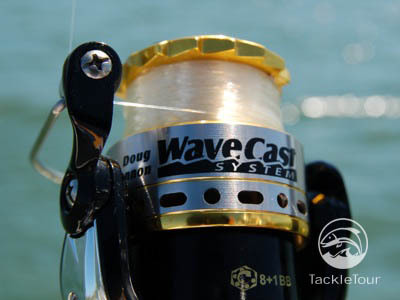 Another marketed benefit of the WaveSpin reel is less line tangles thanks to the spool's lip design. I'm still a bit skeptical of this claim although I experienced nothing during my use of this reel to prove otherwise. More extensive, long term use would be needed to really put this claim to the test, but I certainly had no line management issues during my time with this reel.